The purpose of a structural steelwork specification is to state what materials and products should be used and how work (fabrication and erection) should be carried out, in order to ensure that the completed structure meets the designer's assumptions and the client's needs. Design standards, such as the Eurocodes, give design rules that are valid only if strength, dimensional accuracy and freedom from defects are within presumed limits. The performance of a structure required by regulations will also only be achieved when construction is within presumed limits. The complete 'execution specification' for a structure comprises a range of contractual documents, including drawings, a general specification with technical requirements for supply of materials and products and for workmanship, and project-specific requirements for the individual structure. Rules for the design of steelwork are given in Eurocode 3 Design of steel structures. Within Part 1-1 of that Eurocode, the following basis assumption is stated: "fabrication and erection complies with BS EN 1090". Part 3: Technical requirements for aluminium structures. Conformity with the requirements in Part 1 (which are general statements, referring to the other Parts for detailed technical requirements), when formally declared, permits CE marking of the structure. The technical requirements in Part 2 are comprehensive, covering all types of structural steel (including stainless steel) and types of structure (buildings, bridges, masts, cranes, etc.). It includes references to European standards for products, welding, testing and corrosion protection. Products manufactured in accordance with harmonized European Standards are individually CE marked. All manufacturers of products covered by CE Marking must have a Certified Factory Production Control system in place to the relevant harmonised standard and have been given approval by a Notified Body to apply the CE Mark. Manufacturers must also make available a Declaration of Performance (DoP) when a CE marked product is placed on the market. The DoP serves to deliver the information about the essential characteristics of the product that the manufacturer wants to make available. The manufacturer, by drawing up a DoP, assumes the responsibility for the conformity of the construction product with the declared performance. 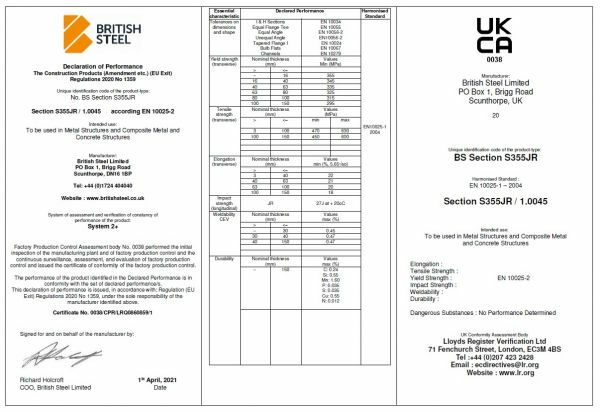 A Declaration of Performance for hot rolled structural steel sections from British Steel is shown and one for fabricated steelwork can be found here. Because BS EN 1090-2 is a comprehensive document, for all steel products and types of structure, it includes numerous instances where options need to be selected or alternatives specified. A summary list of all the options and alternatives is included in an Annex to that Part: many of them are not relevant for ordinary building structures. It is therefore necessary to draw up a set of project-specific requirements that supplement BS EN 1090-2. For bridge structures in the UK, the Specification for Highway Works, or Network Rail's Specification for structural steelwork (which is very similar), will be suitable for most highway and railway bridge projects respectively. For building structures the National Structural Steelwork Specification for Building Construction (NSSS) serves a similar purpose. The NSSS is discussed further below. Even when the NSSS is used for building structures, some project-specific requirements will still be needed and the NSSS defines the "project specification" as comprising the NSSS, with qualification where necessary, together with Part 1 and Part 2 of BS EN 1090. The NSSS was originally developed for use with structures designed in accordance with BS 5950-1 but the 5th Edition covered structures designed in accordance with either BS 5950-1 or Eurocode 3. Since July 2014, all construction products have been CE Marked and since that date, the 5th Edition was available only in a CE marked version for use with structures to be executed in accordance with BS EN 1090-2. The 6th Edition, published in 2017, similarly covers structures designed in accordance with either BS 5950-1 or Eurocode 3 and executed in accordance with BS EN 1090-2. The main changes between the 5th Edition (CE Marking version) and the 6th Edition are briefly described in the following section. These topics present, in a more concise manner, the requirements in BS EN 1090-2 for orthodox building structures. The requirements given in the NSSS should not conflict with those in BS EN 1090-2 but should there be conflict, the NSSS takes precedence as it is likely to be more onerous. Provision is included for modifications to suit any unorthodox construction. The National Structural Steelwork Specification clarifies and aids the process of translating designer's requirements into specific work instructions for execution. Specifiers are encouraged to use the NSSS as the default specification for all steel building structures. Various clauses have been modified to make it clear that under the CDM Regulations all parties have a duty to cooperate with others involved in the construction of the works. Information is increasingly exchanged in electronic format and on government projects Building Information Modelling (BIM) is mandatory. 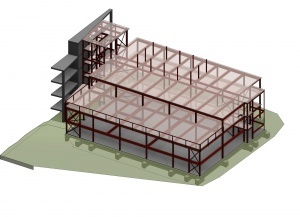 Additional definitions for terms used in BIM have been added and Sections 1 and 3 of the NSSS have been updated to include the BIM information required by and provided by the Steelwork Contractor. UK suppliers and distributors of structural fasteners shall comply with NHSS 3 or an equivalent quality management system. BS EN 1993-1-10 allows fracture mechanics to be used to determine toughness requirements. This approach has been included in Section 2.2.5 as an alternative to selecting the steel qualities according to Table 2.2. Tables for specifying ordinary and preloaded bolt assemblies have been updated and include additional tables for ordinary tie-bar assemblies and matching ordinary tie-bar assemblies. A new Clause 4.11 has been added which describes the method for adding together permitted deviations. Clause 5.3.2 has been modified to allow the Responsible Welding Coordinator to act as the examiner/examining body for the approval of welding procedures provided suitable competence can be demonstrated. Clause 5.6 on the welding of shear studs has been revised and includes requirements for initial type testing and routine testing. A new Clause 11.5 on modifications has been added to make it clear that any proposals to improve or modify the work shall be considered and confirmed by the engineer prior to the modifications being carried out. References to British Standards (issued with BS, BS EN, BS EN ISO or BS ISO references) have been updated. The NSSS addresses the information a Steelwork Contractor needs in order to progress the project efficiently, both for design and for execution. Information needed includes that required for designing the connections, any restrictions on fabrication processes and details of the protective treatment required. The checklists provided in the NSSS attempt to identify any special requirements, so that these are identified at the start of the project. The Steelwork Contractor is required by the CDM Regulations to provide an erection method statement and this must be amplified by drawings. The contractor must also provide certain information such as general arrangement drawings, fabrication drawings and connection calculations. Increasingly, designers and contractors use three dimensional electronic modelling systems; the NSSS makes provision for the transfer of electronic data. On completion, the steelwork contractor is required to provide, either as paper copy or electronically, copies of general arrangement and fabrication drawings. BS EN 10025-2 for rolled sections. BS EN 10219-1 for cold formed hollow sections. For steel members and components, the designer will specify the steel grade (typically S275 or S355) and sub-grade. Guidance on selection of sub-grade (for toughness against brittle fracture) for building steelwork is given in SCI ED007 for buildings where fatigue is a design consideration and SCI publication P419 for buildings where fatigue is not a design consideration. Further general guidance on steel product standards is given in Guidance Note 3.01. In buildings, fasteners will usually be non-preloaded bolts, property class 8.8; in some cases preloaded bolts are required. Product standards for fastener assemblies are summarized in the NSSS. 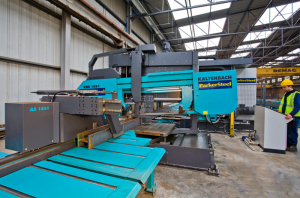 The majority of building steelwork contractors have access to numerically controlled machines for cutting and drilling, often combined in 'saw and drill lines' and other fabrication processes. Small details such as notching may be carried out manually or with the use of CNC controlled machines. The accuracy of numerically controlled fabrication is very high - for example a saw is accurate to a fraction of a millimetre for length and 0.2% of the depth of the cut - and the tolerances specified in the NSSS and BS EN 1090-2 are easily achievable. Similarly, the requirements for thermally cut edges are met with modern equipment. All fabricated items are required to be marked with a unique identifier and this is normal practice in fabricating factories. The identifier ensures traceability to inspection and testing documents. Welding must be carried out by a welders qualified for the particular type of work in accordance with the reference standards. Furthermore, the NSSS requires that the steelwork contractor's system for the management of welding will meet the quality requirements contained in BS EN ISO 3834-3. All welds must be inspected, and a proportion of them should be tested as prescribed in the NSSS. The adherence to the reference standards should ensure that the welding is completed without defects in the welds. The connection designer for building steelwork will often select one particular size of bolt, typically a M20 x 60 fully threaded, non-preloaded property class 8.8 bolt, for economy. Preloaded bolts are selected only when the avoidance of slip in service is necessary. They are more expensive and involve additional cost in fabrication and on site. 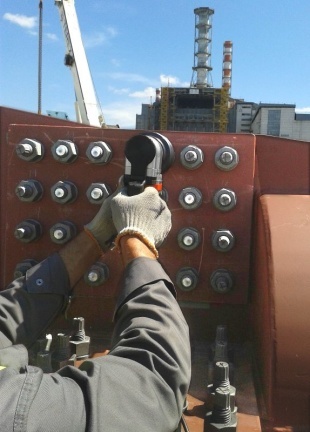 Requirements for installation and tightening of bolts are given in the NSSS and BS EN 1090-2. BCSA publishes a Model Specification for the Purchase of Structural Bolting Assemblies and Holding Down Bolts. The erected steelwork must be within certain tolerances on position and straightness so that the steel can be properly assembled on site, that other building components can be properly constructed on and around the steel frame and that the design assumptions are realised. Permitted deviations (from specified geometry) are given in tabular and diagrammatic form in the NSSS and BS EN 1090-2. These deviations are typically given for fixed points, such as the level where beams connect to columns. The deflections due to loading are not covered by tolerances; if the deflected position is critically important, it is invariably better to make provision for adjustment. The specification of cost-effective protective treatments for structural steelwork should be relatively straightforward for most common applications as long as the factors that affect durability are appreciated. The optimum protection treatment combines good surface preparation with suitable coating materials for a required durability at a minimum cost. Modern practices applied according to the relevant industry standards provide an opportunity to achieve the desired protection requirements for specific structures. It is important to define the corrosivity of the environment to which the structure will be exposed, so that an appropriate protective system is specified. Structures built in low risk category environments require minimal treatment, while structures exposed to an aggressive environment need to be protected with a durable system that may require maintenance for extended life. Painting is the principle method of protecting structural steelwork from corrosion. Hot-dip galvanizing is the most common method of applying a metal coating to structural steel. When specifying protective treatment, designers should to refer to systems rather than particular products. Standard systems for building steelwork are available. The requirements in the NSSS and BS EN 1090-2 relate only to the application of the coating system, not its performance. In some situations, weathering steel may be specified as an alternative to a coating system. Both the NSSS and BS EN 1090-1 require that a quality management system is operated by the Steelwork Contractor and that a certified factory production control (FPC) is in place. When these requirements are satisfied, the structure may be CE marked. Quality assurance (QA) is provided when the whole management system supports the production of a sound product, whereas Quality Control (QC) is ensuring the product meets the specified benchmark. Both of these contribute to the satisfactory quality management of steel construction. The standards describing quality systems are the BS EN ISO 9000 series, with BS EN ISO 9001 giving requirements for quality management systems. As BS EN ISO 9001 may be used in any industry, the Steel Construction Certification Scheme (SCCS) has developed a specific series of schedules for steelwork contracting. One of the British Constructional Steelwork Association (BCSA) membership requirements is the provision of the company's certificate of QA registration.